Review: The ESV Devotional Bible is a wonderful resource for any family, especially those with children. I love that it has the full text of the Bible (ESV Version) along with 130 Bible stories written in language that anyone can understand. 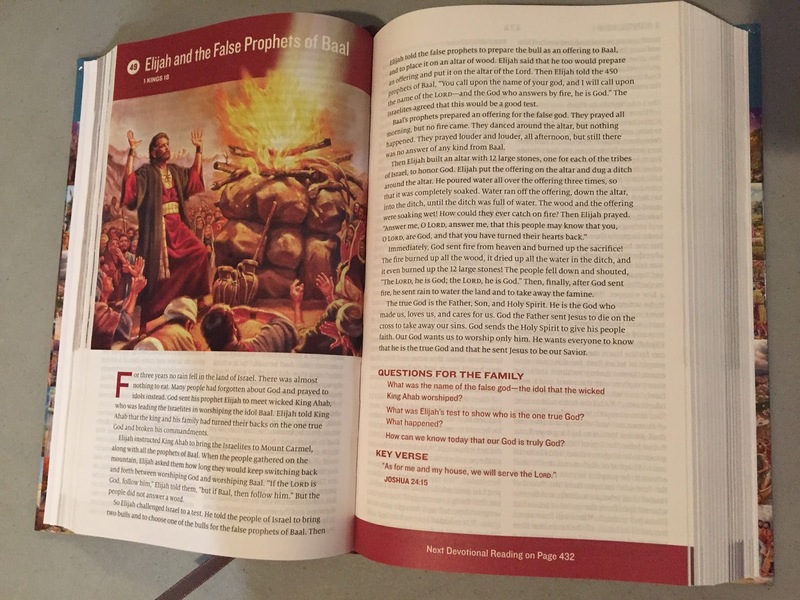 Each Bible story includes a devotion that comprises of questions to explore with the family and a key Bible verse. The illustrations are colorful, vibrant, and engaging. Maps are included at the end of the Bible to further your understanding. The book mark ribbon is a great addition, making it easy to keep track of the current story or section of the Bible you plan to read next. I plan to use this devotional with the family after dinner once the kids get a little bigger. Just don't leave it out for really young kids to peruse....the pages are thin and could easily be ripped out. :) Something I'm very aware of at this stage...my child will rip and even chew on the pages of some books.